Khalid Abu Bakar has been appointed as the new Prasarana Malaysia Bhd (Prasarana) group chairman. 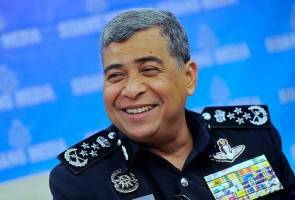 KUALA LUMPUR: Former Inspector General of Police (IGP) Tan Sri Khalid Abu Bakar has been appointed as the new Prasarana Malaysia Bhd (Prasarana) group chairman. According to a report by Bernama, the appointment was announced by prime minister Datuk Seri Najib Tun Razak. Datuk Seri Najib also appointed Khalid as the special envoy to boost ties in efforts to fight terrorism, extremist ideologies and human trafficking. Yesterday, Special Branch Chief Commissioner Datuk Seri Mohamad Fuzi Harun was appointed as the country’s 11th IGP succeeding Khalid. Khalid -- who hails from Seremban, Negeri Sembilan -- has more than 40 years of experience being in the police force and started his career as a police inspector on Dec 5, 1976.